This was a highly complex operation harvesting short steep slopes and building infrastructure in amongst a very busy civil engineering construction site directly above the SH1 motorway leading to Wellington city. Full operational management of Opio Forest harvesting … appreciated the broad depth of expertise provided by PF Olsen Ltd.
"They started on time, did everything promised and we found them very transparent in all communications keeping us well informed at all times". They worked hard to maximise the return we received from our harvest. I have no hesitation in recommending PF Olsen to others. We are extremely proud of our forestry block and we attribute the way it looks to PF Olsen and the contractors employed by our forest manager. PF Olsen won the 2017 award in the Best Collaboration Between PCBU’s category. The family felt privileged and part of the safety acknowledgement. Kevin Thomsen, Hawkes Bay, achieves impressive financial returns from two small blocks harvested in 2016. These blocks have contributed far more economic value than would have been achieved from including them in the other farm production. ... were very responsive to landowner's requests. Issues were attended to promptly. ..... they are local, reliable and have good management systems in place. Would I recommend PF Olsen and his team? Where do I sign? The whole operation went extremely well with no pressure on my son James or myself. Adam Sewell (Forest Manager) impressed us with his professionalism, organisation and up-to-date information. In addition, his thoughtfulness and enthusiasm for his work made the day totally worthwhile. Over a period of ten years involving five forests and 383,600 tonnes of logs the outcomes in all aspects of logging management were impressive. The professionalism if all staff involved, be it planning, field supervision or administration was of the highest standard. Heritage New Zealand wishes to acknowledge the significant effort you have gone to in harvesting around archaeological sites in the Waiotahi Forest. I have been advised that the care that has been take has been excellent. PF Olsen staff and contractors undertook specific heritage training so that Heritage value was understood and respected during the works. We have always found the team at PF Olsen to be knowledgeable, competent, friendly and extremely good with communication or work to be undertaken and results once completed. We were totally impressed by the professional attitude and enthusiasm taken by your representatives, who were an absolute credit to your organisation. They have managed the development of our now 1600 hectares of Pine forest very professionally with regular reporting on progress and problems as they arise. 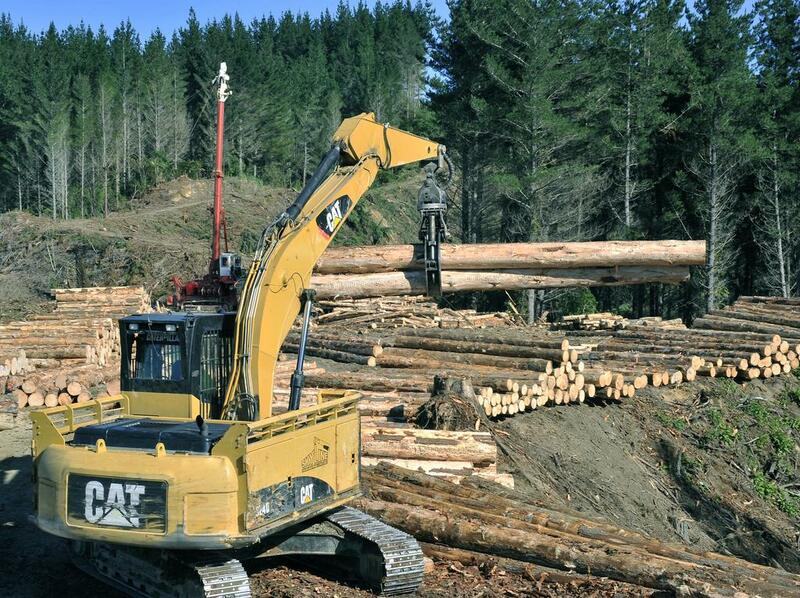 Olsen's Management team in Gisborne have been thoroughly professional to deal with over the period we have been involved with them, and we have no hesitation in recommending them for the Management of the Forest development - as we have employed then for over the past eight years. We are very pleased to entrust the management of our forest to PF Olsen. I was very pleased with the way PF Olsen understood the whole operation on my block of trees. The whole operation was hassle free and we would use their services again without hesitation. Everything went smoothly with no accidents or mishaps and only a bit of down time due to machinery breakdowns.It was very good having PF Olsen supervise the job. Our profile as a Maori Land Trust was enhanced by the employment by P.F Olsen of our own local community members who had a good understanding of the matters that were of concern to us during the actual harvest. I have no hesitation in fully recommending P.F. Olsen to anyone contemplating their Forest Management and Harvest. Our experience with PF Olsen Ltd during this harvest was very favourable. The presentation by you and your colleagues was incredibly informative and beneficial to our participants. The engagement has been/is of a very high standard in terms of the professional but relaxed interaction combined with the timeliness and specific relevance of the information provided. The Committee of Management has no hesitation in recommending Jason Blair and PF Olsen Limited to other landowners and Maori Trusts. I write on behalf of Scion to thank you for all of the work you do for the New Zealand forest industry and the input that you are providing to Scion. Pourau Incorporation look forward to continuing on the good working relationship that we have enjoyed with PF Olsen to date. We are extremely satisfied with our dealings with PF Olsen and would not hesitate to enter into future agreements with them. PF Olsen has proven throughout this process to be willing to listen to the aspirations of the trustees, community and willingly work together. Throughout Rob showed exemplary proactivity and we are very aware that the success of this event is in a large part due to Rob’s efforts. We would like to thank the P.F.Olsen team; Bob, Mike and Rob, for the management of the forest harvesting and keeping our interests at heart. PF Olsen Ltd have taken a positive approach to minimising the environmental impacts of harvesting on this site for which I congratulate them. During the contract term services provided by the Gisborne office staff matched or exceeded contract requirements. The project was completed with a high degree of professionalism in circumstances that were challenging due to the location, and an extreme weather event. We will be very pleased to make PF Olsen’s our on-going first point of contact in future. We look forward to working with the Olsens (Gisborne) team when our 40 hectare plantation is due to be harvested within the next decade. Rob Daunton and PF Olsen have done a great job and I have no hesitation in using them again and recommending them to others. Craig and the PF Olsen's team "can do attitude" leads me to having no hesitation in recommending their services. I would recommend their services to anyone considering harvesting their forest. PF Olsen's management and staff have always been very professional in their dealings with us. PF Olsen Ltd take the issues of Health and Safety leadership and environmental compliance very seriously. PF Olsen's continuing investment in building a safety culture among their workers is just what the initial project aimed to achieve. PF Olsen has provided us with an excellent professional service for many years and has added value to our forestry investment over this time. We were impressed by how professional the contractors employed for harvesting and transport were. I was impressed with the harvesting contractor, who left a tidy cutover and logged all the trees off some very difficult areas. Compared with the last assessment the company has continued to make improvements to the quality and environmental management systems. PF Olsens have, at all times, demonstrated knowledge, experience and expertise in the harvesting business. Timberlands West Coast Limited Chairman Martin Sawyers said that he was sure the forests would be in good hands going in to the new year. In our dealings with PF Olsen we found them highly professional and credible. With no loss of customers or value, it appeared to be an excellent and seamless transition. PF Olsen has worked with log exporters to establish this new logistics initiative and reduce transport distance by over 100kms. I would like to acknowledge the considerable work you health and safety manager, Nic Steens, has put into making this project happen. I wish to advise you that Crown Forestry and our Treasury counterparts were highly satisfied with the advice we received from PF Olsen Ltd.
PF Olsen saw the trees and explained what we could do and how they would be able to help us. PF Olsen have played an important role in Kokakotaea Forestry Corporation Ltd's (KFCL) development, mentoring KFCL during the setting up of its harvesting and marketing operations. Olsens exceeded our expectations, in that they provided us with a comparative model that allows us to change and update inputs as further information becomes available, and test the sensitivity of the results to changes in key variables. PF Olsen has at all times provided sound advice, timely reports and demonstrated a thoroughly professional approach to their role. Olsens have provided this, primarily through regular and thorough dialogue, contractor management, the quality of their reporting and their log checking and auditing systems. We will have no hesitation in inviting them back to complete our harvesting in 2 to 3 years time. PF Olsen & Company Limited has provided Crown Forestry with an excellent service in forest management in our Far North estate. Good communication and setting clear expectations are imperative for maintaining a good relationship with the forest owner. The harvest was completed in a timely and efficient manner with no issues arising during the process.